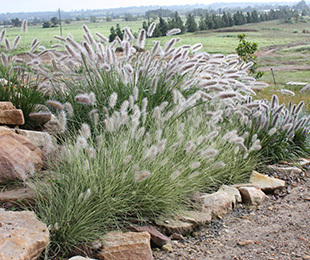 Description: Pennstripe™ Pennisetum is a beautiful contrasting landscape plant with feathery plumes that compliment its fine foliage nicely. It grows to 2/5 the size of its common form. NOTE: Do not get this native Australian Pennisetum alopecuroides confused with the invasive African variety (P. setaceum). The native Australian varieties have a much wider plume than the exotic variety, and are non-invasive making them a safer choice. So far this variety has not produced viable seed. Uses: Mass plantings and specimen planting for borders, rockeries, roadsides, commercial and residential use. Position: Full sun to part shade. 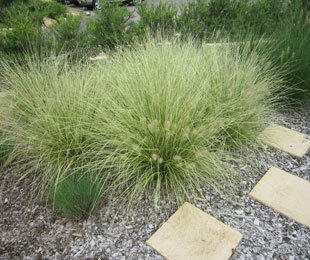 Pennstripe™ Pennisetum suits sandy to heavy clay soils. Tolerates frost, humidity and drought. 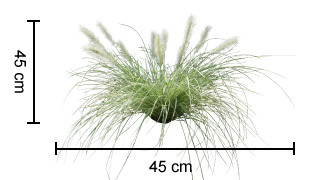 For more detailed information on Pennstripe™ Pennisetum click here.